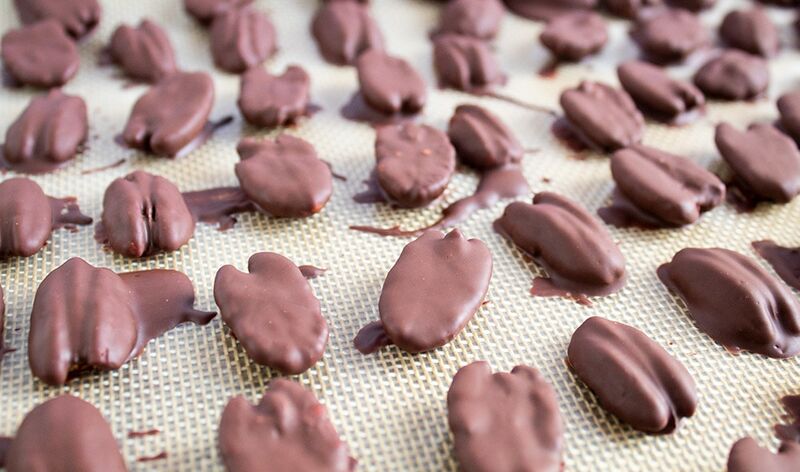 These Chocolate-Covered Pecans are divine and have only 2g net carbs per serving. Even better, this recipe is actually two recipes in one: butter-toasted pecans and chocolate-covered pecans! This post contains affiliate links, which means I’ll make a small commission if you purchase through one of my links. Thank you for your support! Let’s talk about those glorious and chocolatey pieces of heaven in the photo above. They may just become your next favorite keto dessert or snack! 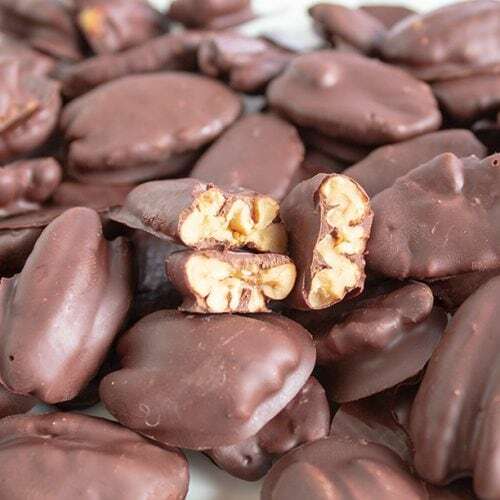 Butter-roasted pecans enrobed in stevia-sweetened dark chocolate and chilled to perfection. HECK YES. Nuts are high in fat, so they’re all perfect for the keto diet, right? Wrong! There are actually plenty of nuts (cashews, pistachios, almonds, to name a few) with net carb counts that can quickly add up. I also found these at my local grocery store (Meijer, if you have one near you). If you don’t want to buy this brand, I have some suggestions later in the post. A really fresh and flavorful coconut oil! My favorite brand of stevia – organic, no fillers, and doesn’t have that bitter aftertaste that a lot of brands of stevia do. 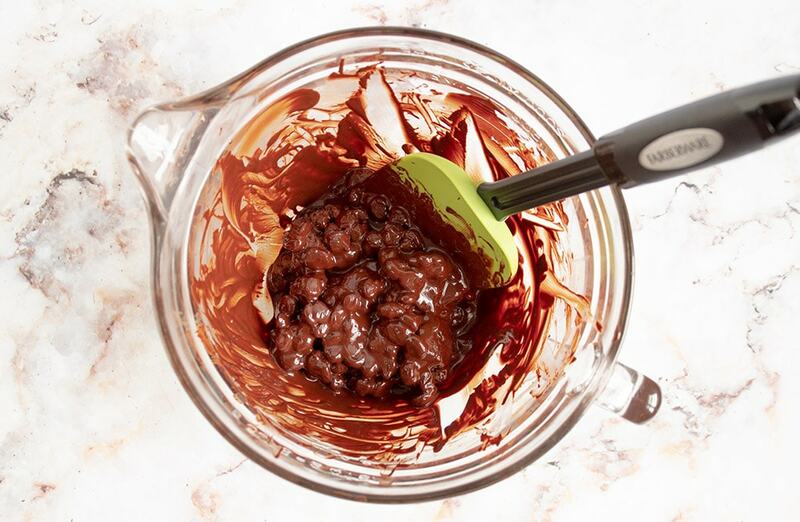 There are two steps to this recipe: (1) toasting the pecans in butter and (2) melting the chocolate and dipping the pecans in this melted chocolate. The awesome thing is I’m actually giving you two recipes in one. You can totally stop at the butter-toasted pecans step and enjoy yummy, slightly sweetened toasted pecans! …and then bake them in the oven. 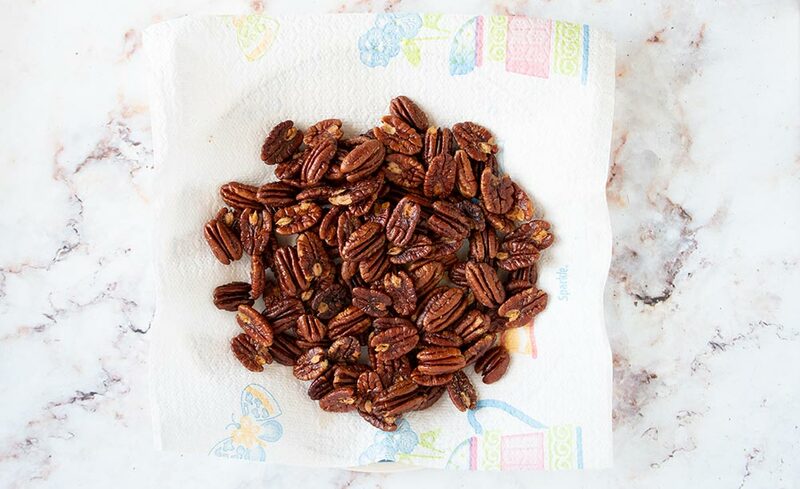 Keep a watchful eye on your pecans the last five minutes to make sure they don’t burn! To the fully melted chocolate, add the coconut oil, stevia, and pecans. Yum-my! Remove each pecan (I used a fork) and place it on a large non-stick baking sheet (preferably covered with a silicone baking mat). Note: You may end up with a small amount of extra chocolate depending on how generous you are (or aren’t) with your dipping. If you do, just refrigerate it in a dish until it returns to chocolate form. Pop the baking sheet in the fridge for at least 30 minutes and out will come your Chocolate-Covered Pecans, ready to eat! The perfect sweet treat for the keto diet. Note: These need to be stored in the fridge or freezer. They’ll start to melt a bit in your hands if you leave them out too long, so only take out what you plan to eat soon. To keep the net carb count the same: If you don’t want to buy the chocolate chips I used, you can use a different 100% cacao chocolate (chips or bars)*. Just make sure that whatever you use has only 2g net carbs per 15g weight. Some chocolate has more, and that will impact the nutrition calculations. If you use a bar of chocolate, make sure to chop the chocolate into smaller chunks. *Note: Reader Wilma said she used Baker’s brand chocolate and it turned out too bitter. While 100% cacao chocolate is naturally intense in flavor, certain brands are better choices than others. The chips I used are great, and Ghiradelli is also a great choice. To slightly increase the net carb count but have a less intense flavor: If you’re not used to the intensity of 100% cacao chocolate, you can use Lindt Excellence 90% Cocoa Supreme Dark instead. You’ll need 240g worth, which is about 2 1/3 bars. Using this chocolate will increase the net carbs to 2.5g per serving. Want More Keto Dessert Recipes? Make sure to check out my Keto Muddy Buddies (aka the best keto dessert ever) and 17 Yummy Keto Cheesecake Recipes That Will Satisfy Your Sugar Cravings! 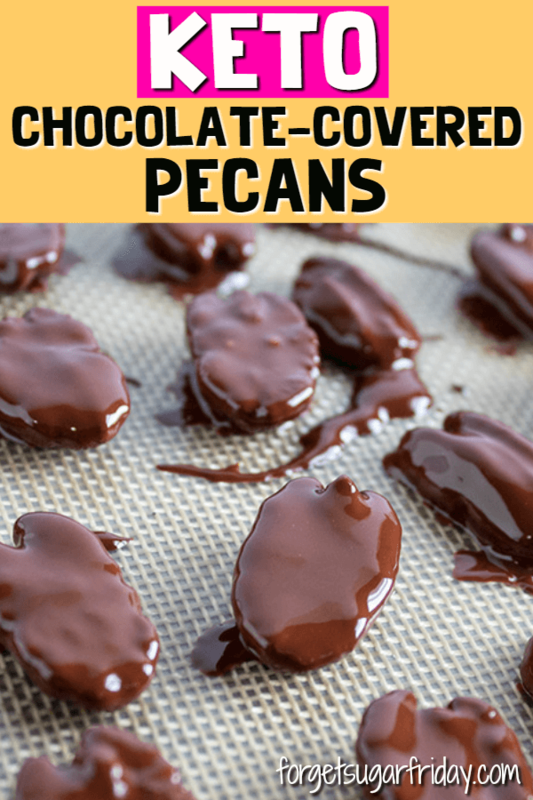 I hope you love this Chocolate-Covered Pecans recipe! If you liked this post, I would so appreciate you giving it a share by using the social sharing icons. Thanks so much! 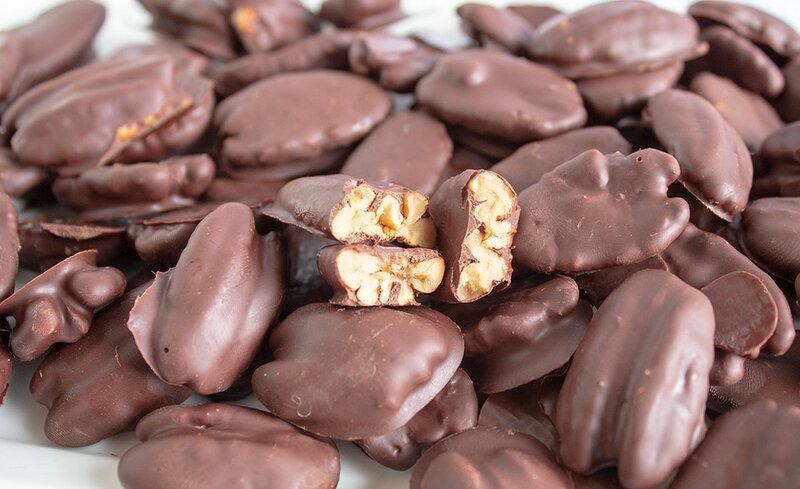 These yummy Chocolate-Covered Pecans are low in carbs and make the perfect snack or dessert! In a microwave-safe dish, melt butter in the microwave for 30 seconds on high. When melted, add stevia and mix. Place the pecan halves in a large bowl and pour melted butter mixture on top. Stir to fully coat the pecans with the butter. 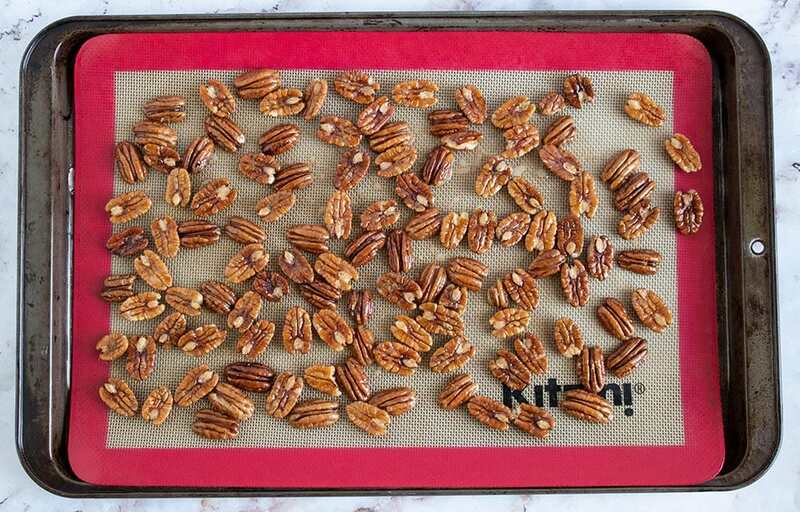 Place the pecans on a large non-stick baking sheet, preferably one covered with a silicone baking mat. Add baking sheet to the preheated oven. Bake for 18-22 minutes, stirring halfway through, watching them carefully the last 5 minutes to make sure they don't burn. 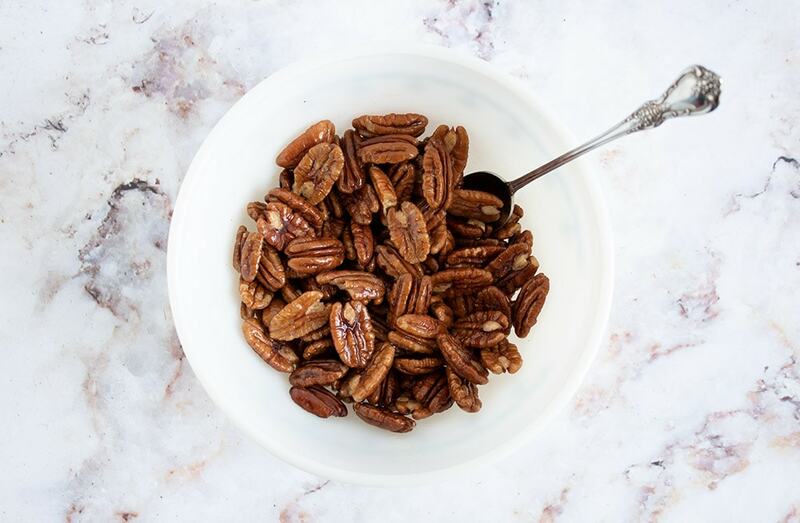 When the pecans are done, set them aside in a large bowl. Microwave the chocolate for 1 minute at 50% power. Remove the bowl from the microwave and, using a flexible spatula, thoroughly stir the chocolate several times. 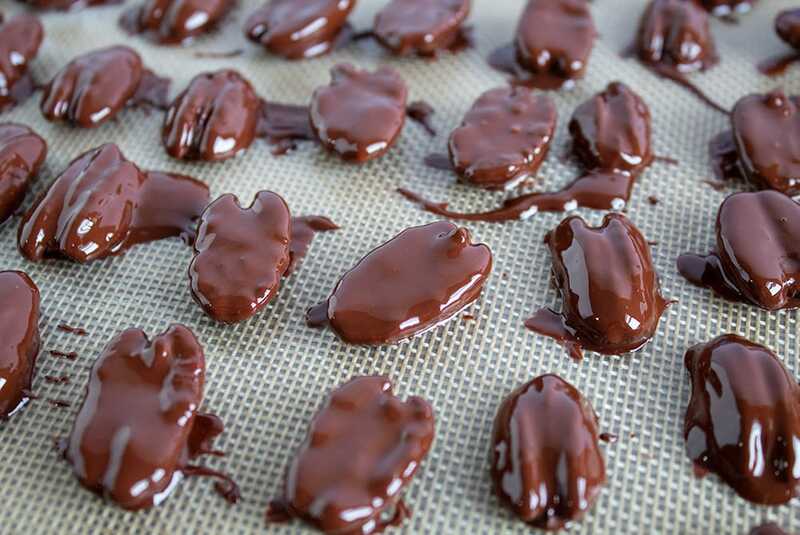 The goal is to distribute the heat so the chocolate melts on its own as much as possible. Return the bowl to the microwave and microwave it for 15 seconds at full power. Again, remove the bowl from the microwave and thoroughly stir the chocolate, distributing the heat and melting the chocolate more. 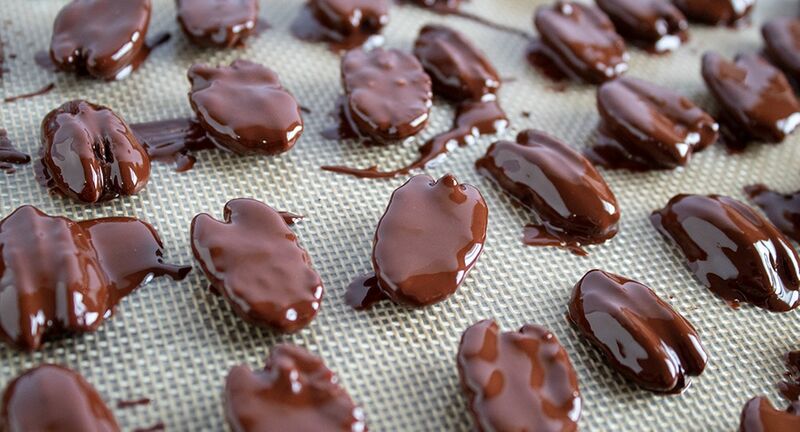 When chocolate is fully melted, add coconut oil and stevia and then stir to incorporate. Add pecans to the chocolate and stir until they're fully coated. Using a fork, carefully remove each pecan and place them on a large non-stick baking sheet, preferably one covered with a silicone baking mat. Leave enough space between each piece so they don't stick together (use a second cookie sheet if necessary). Place the baking sheet in the fridge for at least 30 minutes. Remove from fridge and enjoy! These need to be stored in the fridge or freezer and will start to melt a bit in your fingers if they're out too long, so only remove what you plan to eat immediately. Each serving weighs 30g (just slightly over an ounce). To slightly increase the net carb count but have a less intense flavor: If you're not used to the intensity of 100% cacao chocolate, you can use Lindt Excellence 90% Cocoa Supreme Dark instead. You'll need 240g worth, which is about 2 1/3 bars. Using this chocolate will increase the net carbs to 2.5g per serving. These need to be stored in the fridge or freezer and will start to melt a bit in your fingers if they're out too long, so only remove what you plan to eat immediately. 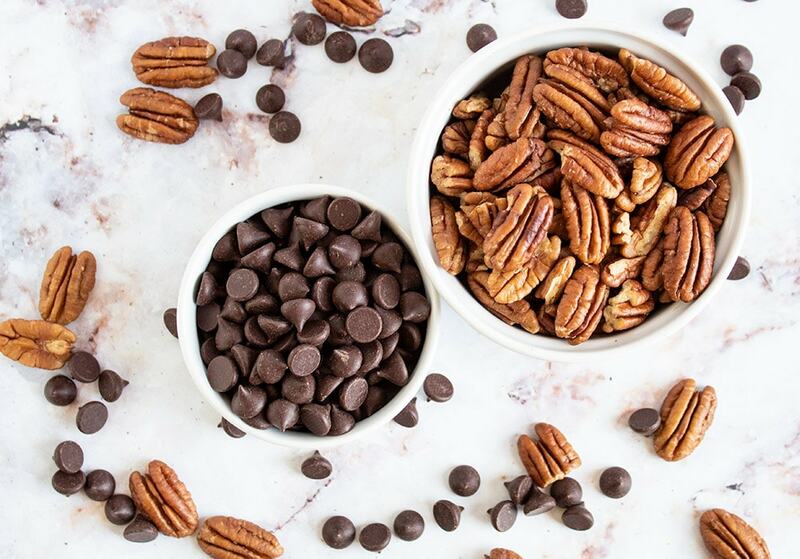 To reduce the carbs in this recipe, you can reduce the chocolate by half and instead make these "chocolate-dipped pecans" by dipping only half of each pecan in chocolate. If you don't want to buy the chocolate chips I used, you can use any 100% cacao chocolate (chips or bars). Just make sure that whatever you use has only 2g net carbs per 15g. Some chocolate has more, and that will impact the nutrition calculations. If you use a bar of chocolate, make sure to chop the chocolate into smaller chunks. Enter the Lakanto Caramel Syrup Giveaway + Huge Lakanto Sale! Do NOT use Bakers 100% cacao squares. These were so bitter when I tried one in the beginning, I added more Stevia. When I took them out of the freezer, they were still bitter. I am going to try them tomorrow using Lily’s sugar free chocolate chips to see if they taste any better. Oh no! 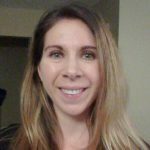 Thank you for sharing; I’m going to add that info to the post. I’ve been spoiled by having access to these 100% chocolate chips, but I’ve had luck with 100% Ghiradelli bars in past recipes. I am sure they will turn out great with Lily’s chocolate chips! I have ordered the Lilys chips (I thought I still had some) but even they have more net carbs than the chips you used. Yours have 2 net carbs for 15 grams – Lilys have 5 net carbs for 14 grams. So I used Hersheys sugar free chips – those are worse yet – they have 8 net carbs in 15 grams. But the pecans tasted delicious! So I am going to have to shop around to find lower carb chips if I make these again. Hi! Can you make the chocolate mix with cocoa powder? Hi Sarah! You could definitely use cocoa powder to make a keto chocolate. Here is a really simple recipe to try. I haven’t tried it yet myself (just found it as I was Googling), but it looks like a winner! If you try it, please let me know… I’d love to hear how it goes! Wow…these are easy to make and delicious!! Yay! 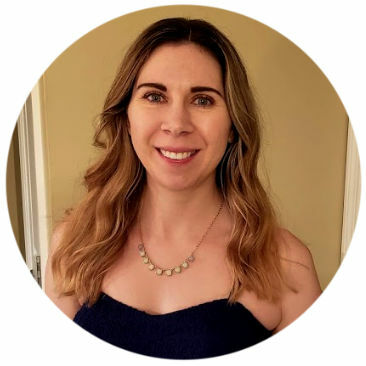 Happy to hear you liked them, Jennifer!